Exercising regularly for weight loss can be challenging for most people. It can even be frustrating when no loss is reflected on the scales. In fact, it shows you are gaining weight. Why does that happen? Believe it or not, this is usually good weight gain. Of course, if you are eating more then this could be the cause. But if not, you can expect the weight to come off over time, so be patient and stay the course. When first starting an exercise program, your body goes through many changes. If you have gone from a sedentary lifestyle to an active one now that you are exercising, your body might be storing more glycogen which it uses as energy to fuel your cells. Glycogen is made up of glucose and water. In fact, one-part glucose and three parts water. So what effect can this have on you gaining weight? The average person carries about 15 grams of glycogen per kg of body weight. If we do the math, we see that a 200-pound person would carry about three pounds of glycogen. However, when you bring exercising into the mix, the actual amount of glycogen stored can increase by quite a bit, meaning carrying more weight. As your body adjusts to its new lifestyle, this excess weight will come off. Another part of adaptation that can cause weight gain are the small tears which occur in muscle fibers as a result of exercising. These small tears are what cause you to be sore after your first few exercise sessions. Another reason gaining weight is you are adding muscle. 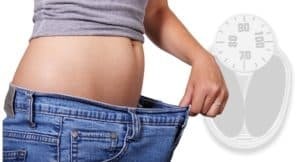 Because muscle weighs more than fat, as you lose fat and gain muscle, your weight might actually show more on the scale, but in reality you are getting healthier. The number on the scale is only one indicator you should watch. Most people put way too much faith in that number. It can fluctuate a lot on a daily basis depending on what is going on inside your body.